Using published markers for polyphenol oxidase (PPO) genes , we confirmed the importance of the Ppo-A1 gene in Australian germplasm, but found no effect for Ppo-D1. Using published markers for phytoene synthase and and ε-cyclase genes that were both segregating in an Aroona/Tasman population, we found a strong effect of Psy-A1 on lutein content, but noeffect of the ε-cyclase. We have also done additional work on Psy-A1 due to its close linkage with the nematode resistance locus Rlnn1. We contributed to the mapping of a locus that affects the composition of flavone –C-diglycosides (FCGs) in the embryo and seed coat tissues of wheat. 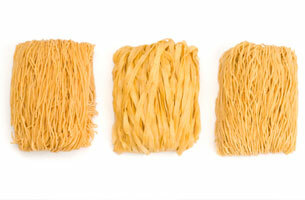 Although colourless in water or acid solution, FCGs turn yellow in alkaline conditions, so are relevant to the making of yellow alkaline noodles.